West Country Buzz works with a variety of stakeholders to support farmers and landowners in Devon to adopt pollinator-friendly farming practices, helping to increase wild pollinators on their farms and across the landscape. The project takes into account arable, pastoral and mixed farming practices. Since the project began in March 2016, West Country Buzz has advised on over 1,600 hectares of land and delivered various farm days and workshops. Providing free one-to-one tailored advice for farmers on habitat management for pollinators. Working with farmers in Devon and the wider south west to encourage uptake of the new Countryside Stewardship Scheme: Wild Pollinator and Farm Wildlife Package, which provides guidance and funding to help manage farmland better for bees and other wildlife. Support and advice is available from our Conservation Officer on where to locate options for biggest impact and success; ongoing management advice; and assistance with the application process. The project also focuses on increasing bumblebee recording in Devon to help us monitor populations, detect warning signs, and target conservation efforts. Our Conservation Officer, Dr Cathy Horsley, is now taking the West Country Buzz project into its second phase. The project will focus on restoring habitat for the Brown-banded carder bee and the Moss carder bee on the north coast of Devon. Cathy has liaised with 6 farmers so far in the targeted area, and will carry out more advisory work with landowners and farmers to improve knowledge and understanding of bumblebee habitats. 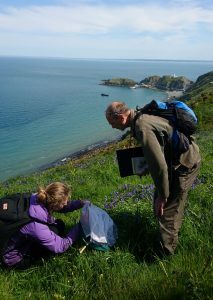 Conservation Officer, Daisy Headley, on Lundy Island, looking for bumblebees! Daisy Headley, our Shrill carder bee recovery Conservation Officer, headed to Lundy Island to survey bumblebees with John Butler (one of our Local Volunteer Coordinators)! Daisy supports Cathy on the West Country Buzz project one day a week. We know very little about the distribution of rare bumblebees in North Devon, so this year we have been carrying out lots of surveys in flower-rich meadows and coastal grassland where they might be found. Two new sites for rare bumblebees have been discovered so far. We are mapping populations and suitable habitat to inform landscape scale conservation work. Local people and advisors have been trained in bumblebee identification through workshops and practice sessions. A Farm Day about pollinators, where neighbouring farmers are invited onto a host’s farm, demonstrated how to manage and create bumblebee habitats. Bespoke advice has been provided to over thirty landowners, and they have been doing fantastic work – creating habitat by introducing bumblebee forage plants, and tweaking management such as leaving areas of meadow uncut until after the latest flying bumblebees have finished their colony cycle. So far this summer we have also carried out three beginner and one intermediate ID workshops and one Bioblitz! Following another successful summer in 2017, the level of interest and positive response received has demonstrated the need and demand for one-to-one landowner advisory work. 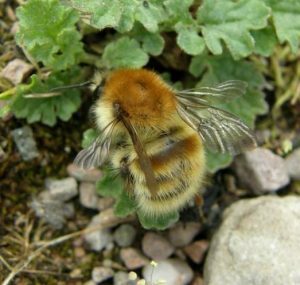 However, the project has highlighted the need to focus its efforts along the north Devon coast, the last stronghold for the Brown-banded carder bee (Bombus humilis) and Moss carder bee (Bombus muscorum) in the county. Both species are listed under Section 41 of the 2006 NERC Act (S41 species), identified as species of principal importance in England for conservation due to their significant long-term nationwide decline. With the generous support from the Prince of Wales Charitable Foundation, the project will begin to shift its focus to this area of Devon delivering three key elements: surveying and monitoring, advice and support to landowners, farmers and the general public and increasing the area of suitable habitat for these two carder bee species. 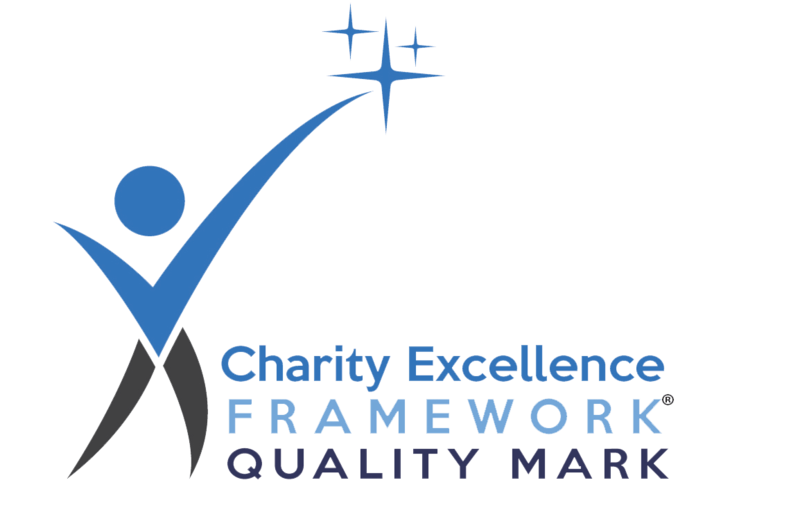 Further information about the project can be accessed by downloading our factsheet. The project is part-funded by Natural England as part of DEFRA’s National Pollinator Strategy. We would also like to thank the Co-op, John Lewis, Prince of Wales Charitable Foundation, Norman Family Trust, Dulverton Trust and Naturesave Trust for their generous funding towards the project.